Analysis An extraordinary conglomeration of technology, politics, and law took place Wednesday night and Thursday morning when the WhatsApp service suddenly disappeared for millions of users in Brazil, Argentina, and Chile. Starting 9pm Wednesday local time, Brazil's four main telcos – Oi, Vivo, TIM, and Claro – complied with an injunction from a court in Sao Paulo and blocked access to the messaging service, which is used by over 90 per cent of Brazilians. The uproar began immediately as millions of people were cut off from one of their main tools of communication. Social media exploded. Within hours questions were being raised in the floor of the Congress – and by raised, we mean shouted. "This is ridiculous. What about our freedom to communicate?" one congressman angrily demanded. The uproar quickly found its way back to the judicial system and the injunction was overruled by a more senior judge. The head of Brazil's telecom regulator put out a statement noting that blocking the app was "not the solution, as it is disproportionate and affects millions of users." The rescinding court order was rushed to the telcos, the service was restored, and as of lunchtime Thursday, Brazilians are collectively wondering what on earth just happened. We have just been witness to the enormous changes that the app economy is bringing to our societies. Prosecutors in the criminal court in São Bernardo do Campo in Brazil's business city of São Paulo are trying to convict a key figure in one of the city's most dangerous criminal gangs, the PCC. The case involves drug trafficking and the prosecution said the person in question made extensive use of WhatsApp while committing his crimes. It asked the Facebook-owned company to hand over details of his private messages, and WhatsApp refused. The prosecution applied to the court and the court issued an order to WhatsApp back in July to hand over the details. Again, it refused. Two weeks later, the court reiterated its demand and fined the company. WhatsApp again refused to hand over the information. At that point, in an effort to exert pressure on the company, which has a limited presence in Brazil, the prosecutors asked the court to approve a 48-hour block on the service. The judge approved it and the court order was sent to Brazil's telcos to enforce. WhatsApp's CEO Jan Koum posted a quick message on Facebook: "We are disappointed in the short-sighted decision to cut off access to WhatsApp, a communication tool that so many Brazilians have come to depend on, and sad to see Brazil isolate itself from the rest of the world." Koum would have been expecting some kind of explosion, but probably not what happened. What did happen, after the estimated 100 million Brazilian users of WhatsApp stopped being able to use the free messaging service, reveals just how much and how quickly society has changed with the use of smartphones and apps. The ban was supposed to last 48 hours, but the service was back up in less than 12 after Judge Xavier de Souza from a different criminal court in São Paulo lifted it and noted that "it does not seem reasonable that millions of users be affected" due to WhatsApp's refusal to cooperate. The judge recommended instead that a larger fine be levied. What's quickly come under question is whether the original injunction was legal or not. Under the much-lauded Marco Civil law that was passed last year, websites are protected from liability for third-party content, and the law specifically prohibits services from being blocked. At the time, the law was hailed as the first of its kind to entrench net neutrality into domestic law. Of course, the counter-argument is that WhatsApp was purposefully impeding a criminal investigation by refusing to hand over information it held. And lawyers have pointed out that under article 12 of the law, judges are allowed to introduce temporary suspensions of services, or even a ban altogether. The spotlight has also swung on the telecom operators: should they not have fought against this injunction, knowing the chaos it would cause? 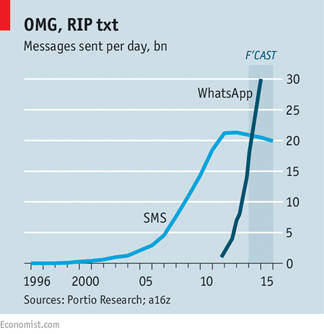 The answer to that question may lie in a graph that shows the sharp decline in use of SMS messaging in Brazil – a service that is almost pure profit for telco operators – compared with the rocketing use of the free WhatsApp service, from which they do not make a dime. What is clear from this case is that the judiciary has not yet caught up with modern realities. It is highly unlikely that the judge would have approved the blocking order if she knew the enormous impact it would have. It is, after all, "just an app." She would not, for example, have demanded that Vivo suspend its SMS messaging service because of its refusal to hand over SMS message for one customer. And despite Marco Civil being put into law last year, how it impacts other longer-standing laws and their interpretation is still very much uncertain. Then there is the fact that, regardless of where you stand on the issue of privacy, WhatsApp did refuse repeatedly to comply with a court order in a criminal case. Just because the service has millions of customers does not put the company above the law. Due to the global nature of the internet, it is now possible for millions of people in one country to use a service from a company that has very limited presence in that country, and which feels it should act according to the laws of its own country. This has been perhaps clearest in the enormous clash between Uber and the authorities in France, Germany, and Belgium. Despite having been subject to raid, fines, and court orders, Uber continues in many respects to ignore the authorities. With limited geographic presence, the law courts are not able to use what have traditionally been their most persuasive pressure tactics – impacting individuals' lives – and are instead reduced to imposing fees. But when these self-same companies are being valued at billions of dollars and possess corporate cultures that revel in "disruption" over the status quo, these fines do not have the impact the courts wish them to. The companies simply pay up and keep moving: the price of doing business, in their eyes. This culture clash between traditional authorities and upstart companies is here and in full effect in Brazil. And let's be honest, it is round one to the app economy. Having refused to comply with court orders and landed with an injunction – something that most companies would do anything to avoid – WhatsApp responded with an air of arrogant disappointment. And then, incredibly, won. That does not mean it is game over. Government is still government and the law courts are still in charge of protecting society. This case will almost certainly lead to in-depth and serious consideration of how to deal with the situation in a way that doesn't lead to embarrassing backtracking. And just in case WhatsApp gets too cocky about its victory, one interesting statistic that emerged from this mess should keep it on its toes: in less than a day, the competing Telegram app was downloaded more than one million times by Brazilians. The extraordinary ease and speed with which companies can win millions of customers is a double-edged sword. Because those customers can just as easily and as quickly jump ship.